Early in this blog’s short history I talked about the opening sequence in Andrew Niccol‘s Lord of War (2005) and what its opening sequence – the ‘life of a bullet’ – had to say about the global arms trade. 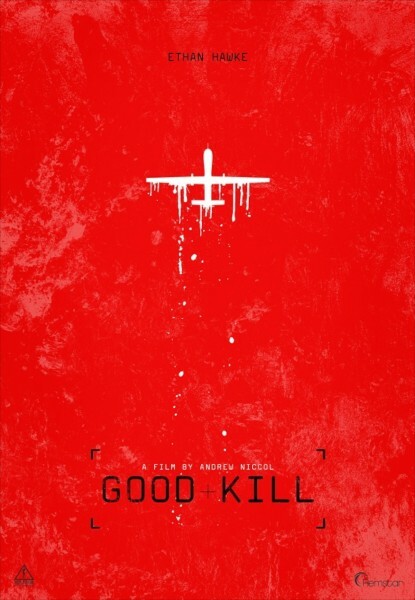 So far, so familiar; there is no shortage of similar presentations of drone warfare in pop culture more generally (I’m thinking in particular of Omar Fast‘s video 5,000 feet is Best and George Brant‘s play Grounded). Cinematographer Amir Mokri (director of photography on Lord of War, Niccol’s satire on the international arms trade) shoots the Vegas desert in a harsh, sterile light. The Las Vegas suburbs, shot from the sky, look as dusty and alien as the places Egan sees on his monitor. It plays into Egan’s isolation. He is distant from his wife (Mad Men’s January Jones) and drinks too much since he lost his flying privileges. He’s got the creeping feeling that drone warfare is cowardly and misses the fear of being in danger. “We’ve got no skin in the game,” he says. His wife says she’s glad to have him home with the kids. Egan zones out and stares at the sky. Niccol creates an atmosphere that is airless and dull, an unusual tone for a modern war film, but one that fits the subject matter perfectly. That would have been enough, but the director feels the need to make his polemic on drone warfare plain. He sets up the team as an ethics debate meet. On one side is Egan and Suarez (Zoë Kravitz), a young female recruit with a conscience. On the other are two knuckleheads with kill boners. They ridicule the idea that they’re doing anything but protecting their country from terrorist threat. Niccol’s script goes too far in singling them out as the idiots. Kravitz’s character, more left-wing and articulate on post-9/11 military mandate, also comes across as one-dimensional. 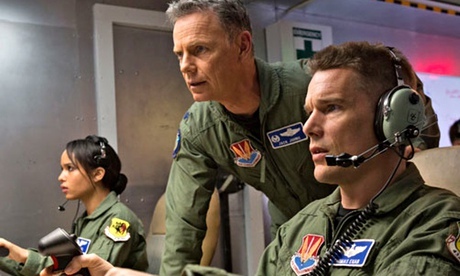 Niccol’s film … is a searching, timely drama about the dehumanising effects of waging war at a distance – the way that guilt can still stain at 11,000 miles, far outside the blast zone of blood and rubble. It looks again at one of the central themes of his script for The Truman Show: the intoxicating, corruptive power of the God’s-eye view. As Egan’s eyes scan the monitors, he sees with astonishing clarity the faces of the men – and sometimes, unavoidably, the women and children – he is about to execute. Over time, he gets to understand their daily routines, watching them eat, stroll and sweep. The difference is this story isn’t science-fiction, but you’re left with the sickening sense that it should be. You can also find an interesting roundtable interview with Niccol and Hawke recorded at TIFF here: thanks to Robert Bridi for the tip. One last thing: I haven’t seen the film yet, but from the reviews and trailers I have seen it seems that, as in so many other registers, popular culture continues to be preoccupied with what happens in Nevada – and what happens on the ground is left shrouded in so many shades of grey. 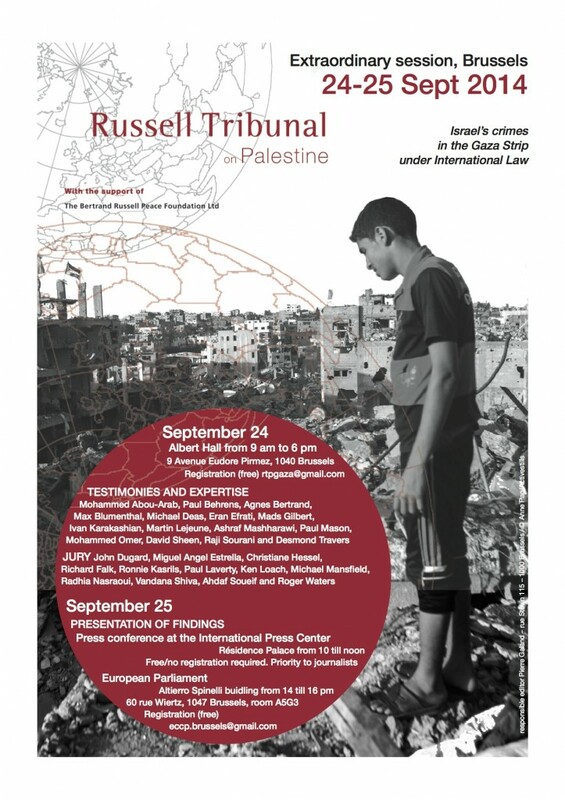 I’ve posted about maps of this summer’s Israeli assault on Gaza before (see also here), and in the light of those discussions Max Blumenthal‘s testimony before the Extraordinary Session of the Brussels Tribunal on Gaza this past week was exceptionally interesting. He arrived in Gaza on 15 August, at the start of yet another ‘humanitarian ceasefire’, and recorded testimony from residents from several of the areas destroyed by the Israeli military. 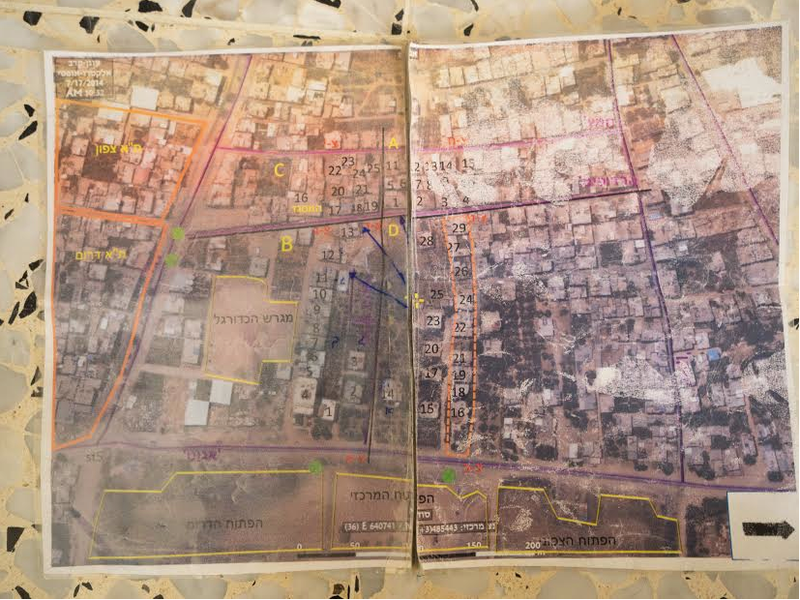 The map you are looking at offers an indication that not only were individual soldiers able to devise their own “invisible” red lines, there was an explicit policy to transform areas of central Shujaiya into free-fire zones where civilians could be killed simply for being present. In orange, in the upper center of the map, the phrase, “Tzir-Hasuf,” or “We cleared it out,” appears. All homes along this road were destroyed. In fact, most of the homes in the entire area displayed on the map were razed to the ground. In the upper-right-hand corner of the map, inscribed in red Hebrew letters, you can see the phrase, “Hardufim.” This is code invoked over army radios to indicate soldiers killed in combat. According to Efrati, the phrase was used during Operation Cast Lead to delineate areas where Palestinian civilians could be killed. It appears this line was drawn in Shujaiya after the Golani Brigade lost 13 soldiers during clashes on the evening of the 19th — when “Hardufim” was heard blaring across Israeli army radios — before they occupied homes in Shujaiya the following morning, when the now notorious videotaped execution of 22-year-old Salem Shamaly occurred. “Mass violence is poorly understood if it simply refers to casualties on battlefields or continues to be framed through conventional notions of warfare. We need to interrogate the multiple ways in which entire populations are rendered disposable on a daily basis if we are to take seriously the meaning of global citizenship in the 21st Century”. 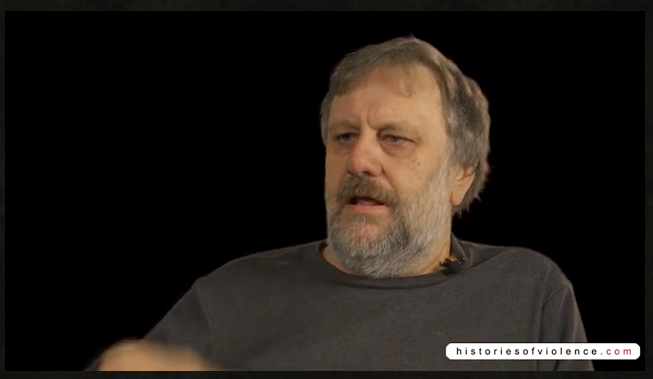 For Zizek, the issue of ‘disposable lives’ in the contemporary period does not simply relate to some small or invisible minority. According to the new logics of global capitalism, the vast majority of the worlds citizens (including almost entire Nations) are deemed to be worthless and superfluous to its productive needs. Not only does this point to new forms of apartheid as the global cartography for power seeks to police hierarchies of disposability, it further points to a nihilistic future wherein the aspirations of many are already being sacrificed. I agree with Brad’s framing of the project – impossible not to, I think – but once you start to imagine the global in these (un)exceptionable terms, both conventional and unconventional modes of warfare start to seep back in to the discussion. For on those now radically dispersed and discontinuous battle spaces whole populations are being rendered disposable on a daily basis. As part of my project on Militarized Vision I’ve been drawing together my work on two air strikes in Afghanistan in which the full motion video feeds from UAVs played a central role. The first was an air strike in Uruzgan on 21 February 2010, which was carried out by two combat helicopters but mediated by video and commentary from a Predator and other eyes in the sky (the most thorough press account is by David Cloud here). The second was a ‘friendly fire’ incident in the Sangin valley on 5 April 2011 when a Predator strike claimed the lives of two US Marines (you can find an excellent summary account by David Cloud and David Zucchino here). The two reports I’ve just cited were published in the LA Times‘ Combat by Camera series, but a close reading of the two official investigations – thousands of pages obtained through FOIA requests – inevitably shows that the stories were more complicated than the tag-line implies. Still, for all the differences there are some remarkably close parallels between the two, and these have prompted me to revise (in radical ways) the analysis I originally offered in “From a view to a kill” (DOWNLOADS tab). I’ve seen you starin’ out at me. You are not the one to blame. 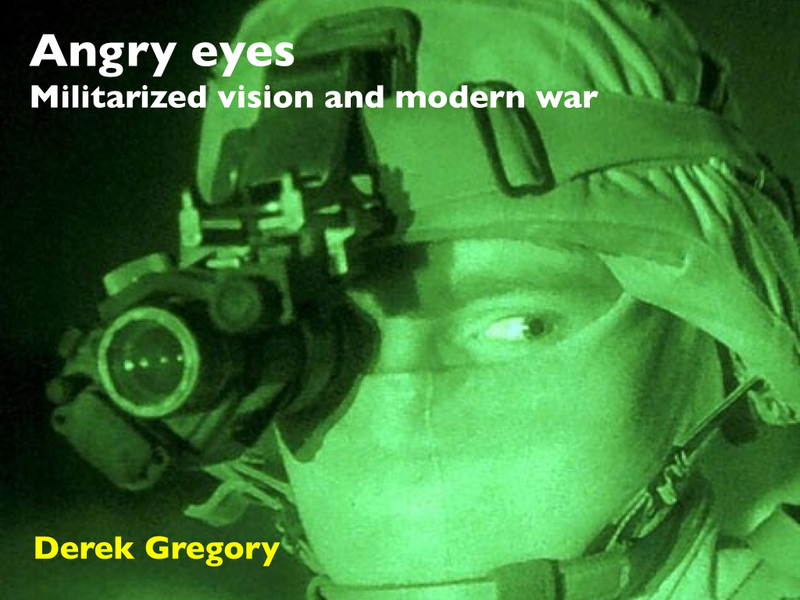 So the presentations (here in Vancouver, and in Zurich and Bergen) will be called “‘Angry eyes’: militarized vision and modern war”. As the image implies, there’s more to this than full motion video displays, and I’m also going to try to say something about the genealogy of what Paul K. Saint-Amour calls ‘optical war’ (and its distance from the corpographies of ‘boots on the ground‘). More on all this later, when I’ve finished the essay that I am presently spinning off the presentations with the same title; it’s the last thing I have to do for “The everywhere war” (I hope). One of the most shop-soiled phrases of the past several weeks and months is “boots on the ground” (or the lack of them). You can find historical and contemporary discussions from the US military here and here, but the most recent – and recurrent – instance is President Obama’s insistence that, whatever else the United States will do in Iraq and Syria to counter the aggressive advance of the Islamic State, it won’t involve “boots on the ground”. The reasons are not difficult to discern, and they involve the substitution of “boots on the ground” for “bodies in bags” (on which, see the American Friends Service Committee exhibition, “Eyes Wide Open“: also the Burning Man version here). American advisers could be sent to the front lines alongside Iraqi and Kurdish troops, and could even call in airstrikes, without directly engaging the enemy. It is a definition rejected by virtually every military expert. There are also not very muffled echoes of Vietnam and the US Military Assistance Command. 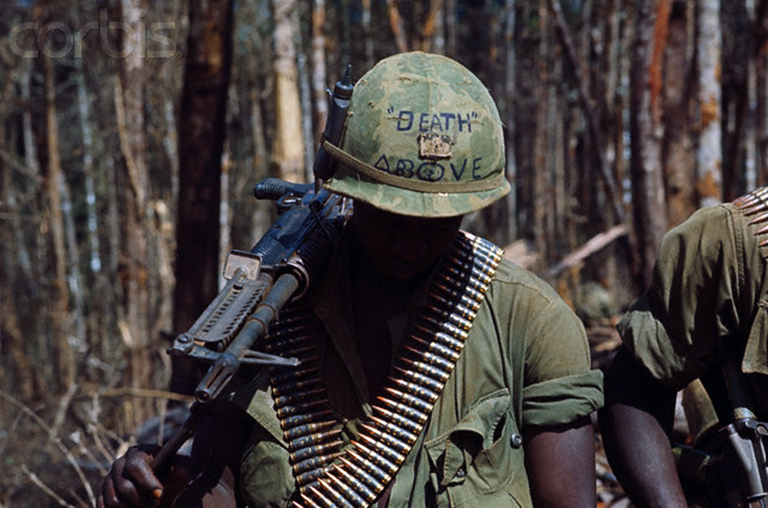 This is very much on my mind, because I’ve been busy finishing the long-form version of “The Natures of War”, and in the process radically re-working my discussion of the ground war in Vietnam. This has given me a new insight into what “boots on the ground” means – with an emphasis on the “ground”, or what my good friend Gastón Gordillo prefers to call terrain – and here is an extract (I’ll post the full draft next week, which will include the references and the footnotes). 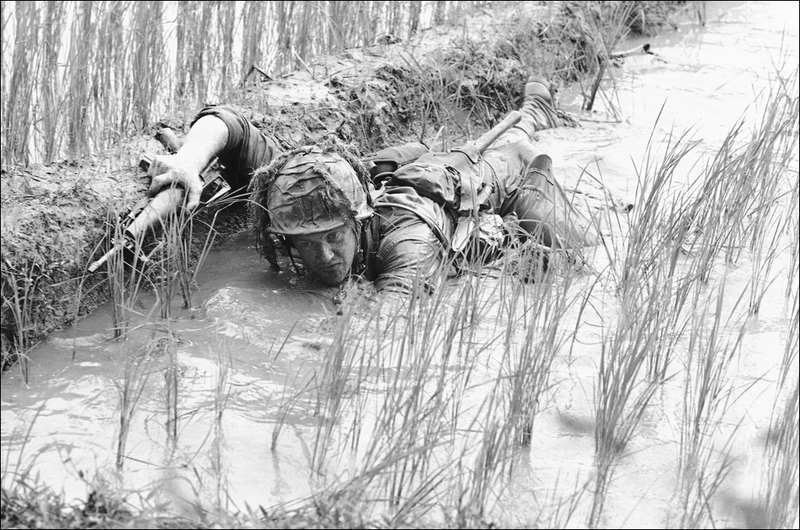 O’Brien was describing a patrol moving through rice paddies, and these imposed their own burdens on soldiers. Out in the open they were vulnerable to attack or sniper fire, and they avoided the dikes which were often mined or booby-trapped. 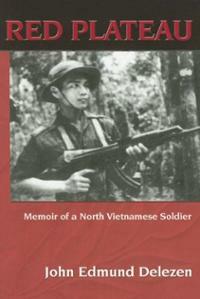 ‘[T]he mountain that we are now climbing has been attacked by countless sorties of Phantom jets delivering “snake and nape.” The splintered, tortured tree trunks are black and charred from the napalm and the oily gel that did not ignite has mixed with the red mud, turning it into a texture similar to axle grease. My pack and ammo belt are waterlogged and have picked up extra weight from the greasy mud. There’s much, much more, as the full post will show, but I’ve said enough to convey some of the ways in which “boots on the ground” are involved in my developing interest in corpography and war. This extract also raises two other issues that I can’t develop in any detail in the essay. ‘As dark nears we once again move onto the path and begin our trek south, I curse my pack; if not for this burden I would move effortlessly. 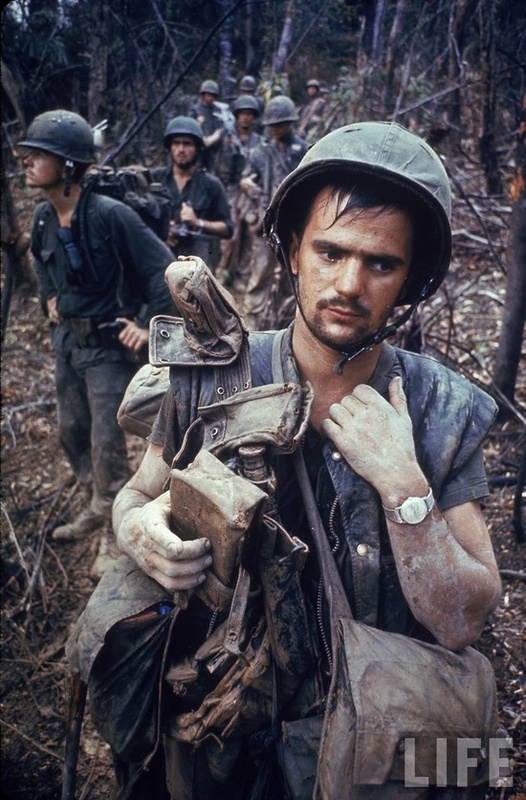 Each pack contains an extra uniform and one pair of pajamas, a rain-sheet, a ground cloth, a shovel, ammunition, grenades, explosives, a small medical kit, B-40 rockets for the RPG crews or boxes of machine gun ammunition for the crews and toilet articles which are for the most part extremely minimal. 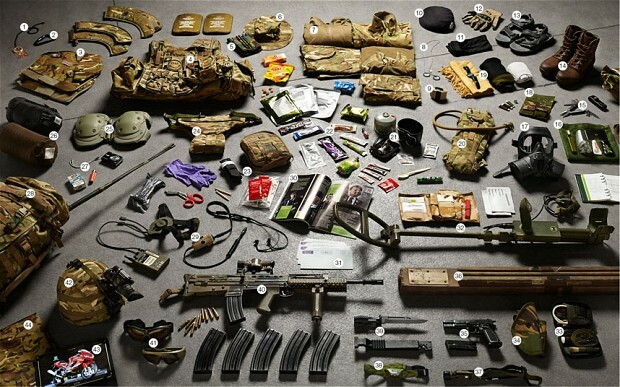 In addition to this loaded pack, we each carry our individual weapon with ammunition vest, knife and canteen of water. 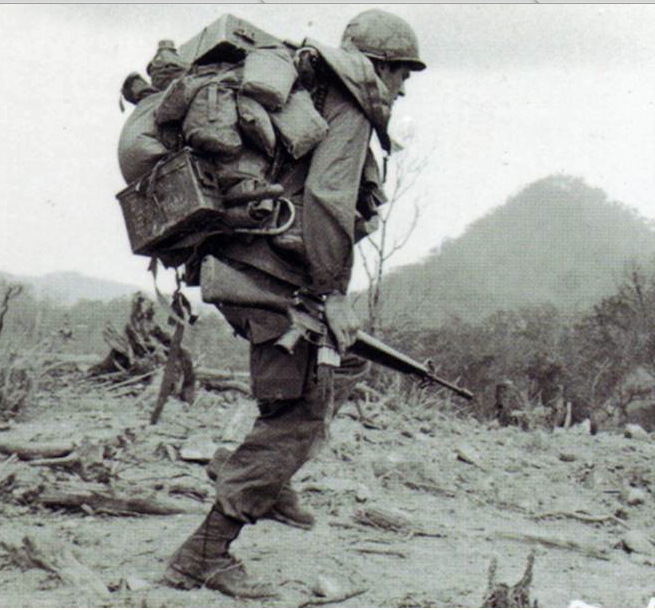 The heavy weapon crews and mortar teams suffer worse…much worse, the load they carry is unimaginable…. The second issue is the genealogy of “the things they carried”, and Tom Atkinson (really; not quite “Tommy Atkins” but close enough) has provided an extremely interesting visual reconstruction of what he calls “Soldiers’ Inventories” here (you can also find more here and here). His 13 images extend from the Battle of Hastings (1066) through the Somme in 1916 and the Battle of Arnhem in 1944 to Helmand in 2014 (shown below), though since this is an inventory of British soldiers there’s no trace of Vietnam. 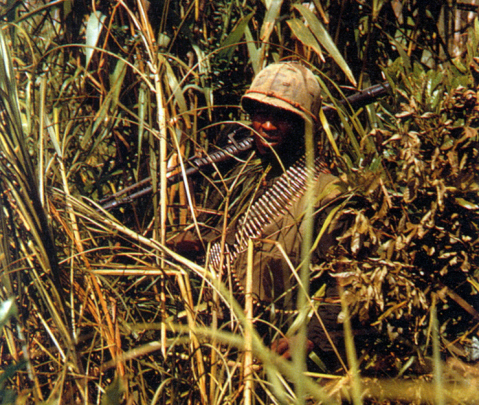 (Interestingly, though, a common complaint from US soldiers and especially Marines in Vietnam was that much of their equipment was outdated and derived from the Second World War – including, on occasion, their canned rations). I am not saying that the infantry today has it easy. Certainly the communications with home have changed, but the field conditions, such as filth, cold, heat, fatigue, and lack of sleep, have not changed since the infantry was using rocks. However, the trend is clear. Robots are already being deployed for fighting in cities. And soon they will be able to be controlled from Nevada. 7th International Conference of Critical Geography, ‘Precarious Radicalism On Shifting Grounds: Towards a Politics of Possibility’ in Ramallah, Palestine, 26-30 July 2015. The aim of the 7th International Conference of Critical Geography (ICCG 2015) is to provide an inclusive venue for the discussion of these and other themes that examine the geographies of critical social theory and progressive political praxis. Despite the significance of the issues at stake, we hope to create a fun, engaging and friendly atmosphere that welcomes a wide array of scholars, activists, artists, organizers and others interested in critical socio-spatial praxis. The conference will be held in Palestine, a rich context for critical geographers and others to observe first hand, learn about, and engage with the human, political and economic geographies resulting from more than a century of European settler colonialism and US imperialism. Palestine is however much more than the ‘object’ of imperial, colonial and capitalist forces. It is a place that stands at the heart of the recent Arab uprisings as an inspiration drive to the popular struggles that have profoundly shaken the Arab World and beyond in ways yet difficult to anticipate. Palestine will undoubtedly be an ideal site from where to pursue the mission and commitment set forth in the ICCG’s statement of purpose – that is “developing the theory and practice necessary for combating social exploitation and oppression”. Deadline for submissions is 1st December 2014. We invite you to submit paper abstracts and encourage proposals for populated panels, roundtable discussions, or sessions with alternative formats that address the proposed conference themes. As indicated in the application form, we ask that you include (a) information on which conference theme your panel or paper addresses; (b) title of your paper or session; (c) a brief bio (max. 100 words) of each participant with contact information, institutional affiliation, and any titles you would like placed in the program; (d) an abstract (max 500 words). Please take into consideration that proposed activities should fit into the 90-minutes time-slots. Full details here. Space is limited to 250 participants. The conference complies with the Palestinian Call for the Academic and Cultural Boycott of Israel. I’m late coming to this – partly because I’m just back from Finland, and partly because term is upon us…. 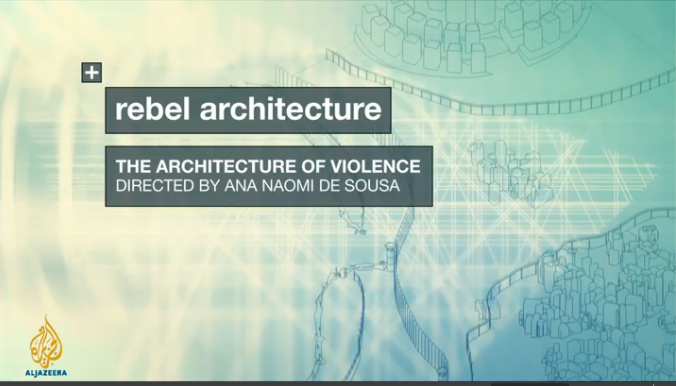 Here is an excellent short documentary from Al Jazeera featuring Eyal Weizman on ‘The architecture of violence‘, explaining the ‘slow violence’ of architecture in the Israeli occupation of Palestine and the evolution of urban warfare. 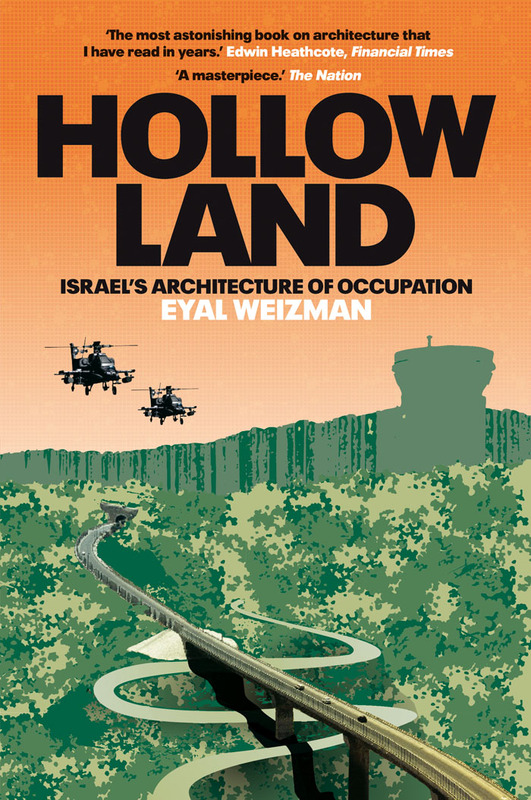 It also documents the trajectory of Eyal’s work, from the brilliant Hollow Land through to forensic architecture (as he says ‘the crime was done on the drawing-board itself’). Until recently I would look at images of these ruins and see nothing more than potent monuments of destruction. Traces of lives eliminated or chased away. But they are more than that. Making The Architecture of Violence with the architect Eyal Weizman has shifted my gaze, taught me to look at buildings and ruins as objects that bear witness to events and that can speak to us – we just need to know what questions to ask them. From the moment we started developing this series, the idea behind Rebel Architecture was to look beyond so-called starchitecture – beyond the architectural ostentation of technological feats, and towards a more socially aware, though still creative architecture serving the people on the ground. But it was also to use architecture as a way of exploring different environmental, social and political realities around the world. While many of the documentaries in our series have looked at how architecture – the design and construction of physical structures – is being used by architects to respond to rapid urbanisation, pollution, limited resources or natural disasters, The Architecture of Violence is a different kind of film. When I came across the work of Eyal Weizman, I realised that there was a completely different way of using architecture and of being an architect. Weizman’s work lies at the intersection of architecture with politics, violence, conflict and human rights. As an Israeli architect opposed to the occupation of the West Bank and Gaza Strip, he fell foul of the Israeli architectural establishment early in his career, and was forced to explore alternatives to “building buildings”. Our film looks at how architecture can be used to interpret, protest and resist, in Weizman’s case, the Israeli occupation of the West Bank and Gaza. I’ve embedded the video from YouTube below, but if you have difficulty accessing it clink on the link above, which will take you directly to the original on Al Jazeera.